with your ol' friend . . .
A little ingenuity and a well-stocked repair kit can prevent a broken ski tip or a flattened mountain bike tire from becoming a serious problem deep in the bush. To assemble your own wilderness repair kit, review the suggestions below, customizing them to meet the space, weight, and repair needs of your outdoor adventure. Developed during WW II, duct tape is at the top of everyone's list. Its innumerable applications include sealing a leaky tent seam, mending a torn rainsuit, or reattaching a delaminated boot sole. Splinting a broken arm or a busted ski is easier with duct tape too. Hikers use it on their feet to prevent blisters. Cross-country skiers with a broken binding have avoided spending a long, cold night in the woods by simply taping their ski boot to the offending ski. To carry, wind a piece around a pencil or ski pole. Or better yet, pick up a pocket-sized, 5-yard roll of 3M Scotch No. 127 "Cloth or Duct" tape at Wal-Mart. With their pliers, screw drivers, files, knife blades, scissors, tweezers, and awls, a Swiss Army knife and a Leatherman or Gerber multi-tool are essential tools in the outdoors. While both sport plenty of tools, neither one alone will allow you to simultaneously secure the head of a screw AND twist loose a stubborn nut at the other end. A short section of a coarse-tooth hacksaw blade can also be useful. Whether you need to simply replace a button or reattach an all-important shoulder strap to your rucksack, a good sewing kit is a must. It should include a couple buttons, small squares of fabric, and some mosquito netting. For sewing, include 2 fine needles with a length of light nylon thread, 2 heavy-duty needles with some carpet-grade nylon thread (use dental floss in a pinch), and a couple of 3-sided, large-eyed leather needles with a piece of heavy-duty, waxed nylon thread. A leather or metal finger thimble is essential for hand-sewing with a large needle. If an extra three ounces is not a problem, carry a "Speedy Stitcher" sewing awl instead of the leather needles for demanding repairs. At only $7 (Campmor no. 21788), they're a real bargain, and a spool of thread and extra needles store conveniently in the wooden handle. A 50-foot chunk of 1/8-inch, braided nylon cordage has dozens of uses including lashing a broken paddle shaft together, rigging a tarp, replacing a boot lace, and improvising a traditional snowshoe binding to replace a broken "high-tech" one. A 12-foot length of bailing wire is equally handy. Include a piece of a hot-glue stick, adjustable-flame lighter, matches, and maybe even a couple of small hose clamps. Four large blanket safety pins and a 6-inch-long piece of wide, sticky-back Velcro can quickly take the place of a blown zipper on your parka or sleeping bag. While you're at it, add a few activity-specific repair items to your repair kit. For example, cross-country skiers will want to carry a spare ski tip, extra screws to replace a binding, and perhaps even a hard-to-find, no. 3 pozidrive-type screwdriver (Tognar Toolworks no. SVT-THD). Fishers should be prepared to repair a damaged rod or a sluggish reel. Backpackers will need items to repair a clogged stove or a leaky inflatable sleeping pad. Mountain bikers will want to pack a spoke wrench, Allen wrenches, chain tool, adjustable wrench, tire repair kit, tire irons, spare tube, and an air pump. To learn more about assembling an all-purpose repair kit as well as how to make field-expedient repairs to tent zippers, neoprene gear, cook stoves, optics, skis, snowshoes, canoe hulls, paddles, and lots of other gear, read "The Essential Outdoor Gear Manual: Equipment Care and Repair for Outdoorspeople," by Annie Getchell (Ragged Mountain Press, 1995, ISBN 0-07-023169-9, 1-800-822-8158). Your local hardware store, backpacking outlet, ski shop, Campmor (www.campmor.com, 1-800-230-2153), and Tognar Toolworks (ski tools, www.tognar.com, 1-800-926-9904) are excellent places to purchase items for a repair kit. To make sure your next wilderness adventure comes off without a hitch, stow a compact repair kit in your rucksack today. See you in the bush. When sewing clothing for the wilderness, always make sure the finished size of the garment will be cut large enough to allow for maximum layering and freedom of movement later. 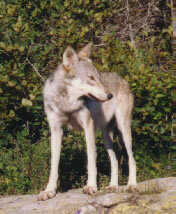 Several loose-fitting layers are the warmest and most versatile in the bush. Sew with non-cotton thread, either nylon or polyester, as cotton rots too easily in wet environs. All fabric edges--even those with waterproof coatings--should be bound to prevent unraveling later. Either zigzag stitch the edge or bind it with one-inch-wide grosgrain ribbon. Hot cutting or flame sealing the fabric edge is also a good idea, but in time, it too will unravel unless it's backed up with hemming or binding. To prevent seams from tearing out under stress, never sew closer than 3/8 of an inch from the edge of fabric. Staying 1/2 of an inch away would be the best for long-term, trouble-free use. To prevent perforating a fabric with closely placed needle holes and having the fabric fail along the stitch line, always choose the longest stitch length. Eight to ten stitch holes per inch is best. On Velcro, stay 1/4 of an inch away from the edge to prevent unraveling later. 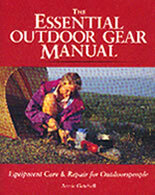 Select "camping and hiking," then "clothing and fabrics"
** Essential Outdoor Gear Manual--Equipment Care & Repair for Outdoors People, by Annie Getchell (Ragged Mountain Press, 1995). 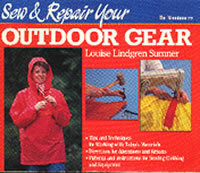 See pages 1 through 77 for an excellent primer on sewing wilderness gear. 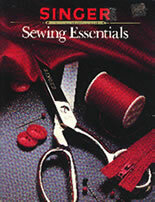 Complete Book of Sewing, by Deni Bown (Dorling-Kindersley, 1996). A great sourcebook for beginners and professionals alike. Complete Guide to Sewing--Step-By-Step Techniques for Making Clothes (Reader's Digest, 1995). 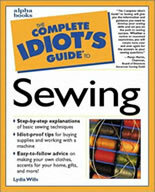 Regarded by some as "the bible of sewing," and "the best all-around handbook." 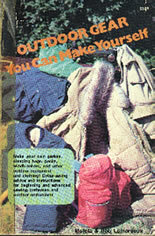 More Polarfleece Adventures, by Nancy Cronwell (Krause Publications, 1999). Covers techniques for sewing with fleece. Okpik--Cold-Weather Camping (Boy Scouts of America, 1995). Lots of good info on making cold-weather camping gear. Sewing Essentials, by Singer (Cy DeCosse Inc., 1984). A great book for beginners. 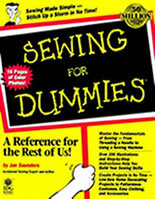 Sewing for Dummies, by Jan Saunders (IDG Books Worldwide, Inc., 1999). Good basic manual. Sewing with an Overlock, by Singer (Creative Publishing International, 1989). Covers sewing with a serger. Online fabric store, renaissance fabric, vestment brocade supplier. Fabrics, fabric paints & dyes, etc. Great search engine for finding all things fabric. Great search engine for finding fabric suppliers. Lots of general fabric listings.